It has become customary to judge the success of a society through the use of objective indicators, predominantly economic and social ones. Yet in most developed nations, increases in income, education and health have arguably not produced comparable increases in happiness or life satisfaction. While much has been learned from the introduction of subjective measures of global happiness or life satisfaction into surveys, significant recent progress in the development of high-quality subjective measures of personal and social well-being has not been fully exploited. This article describes the development of a set of well-being indicators which were included in Round 3 of the European Social Survey. This Well-being Module seeks to evaluate the success of European countries in promoting the personal and social well-being of their citizens. In addition to providing a better understanding of domain-specific measures, such as those relating to family, work and income, the design of the Well-being Module recognises that advancement in the field requires us to look beyond measures which focus on how people feel (happiness, pleasure, satisfaction) to measures which are more concerned with how well they function. This also shifts the emphasis from relatively transient states of well-being to measures of more sustainable well-being. The ESS Well-being Module represents one of the first systematic attempts to create a set of policy-relevant national well-being accounts. The first six authors were the members of the Questionnaire Design Team for the ESS Well-being Module, which was led by Felicia Huppert and Nic Marks. We are grateful to Anne Gadermann and Dr. A. C. Plagnol for assistance with data analysis, and to an anonymous referee for useful suggestions. Thanks also to Drs. Rosemary Abbott, Daniel Johnson, Gabrielle Osborne and to Julie Aston for editorial assistance. I’m always optimistic about my future. In general, I feel very positive about myself. At times I think I am a failure. On the whole my life is close to how I would like it to be. How satisfied are you with how your life has turned out so far? How satisfied are you with your present standard of living? All things considered, how satisfied are you with your present job? How satisfied are you with the balance between the time you spend on your paid work and the time you spend on others aspects of your life? I feel I am free to decide for myself how to live my life. In my daily life I seldom have time to do the things I really enjoy. In my daily life I get very little chance to show how capable I am. Most days I feel a sense of accomplishment from what I do. I like planning and preparing for the future. When things go wrong in my life, it generally takes me a long time to get back to normal. I generally feel that what I do in my life is valuable and worthwhile. To what extent do you get a chance to learn new things? To what extent do you feel that people in your local area help one another? To what extent do you feel that people treat you with respect? To what extent do you feel that people treat you unfairly? To what extent do you feel that you get the recognition you deserve for what you do? Considering all my efforts and achievements in my job, I feel I get paid appropriately. There are people in my life who really care about me. I feel close to the people in my local area. For most people in [COUNTRY] life is getting worse rather than better. The way things are now, I find it hard to be hopeful about the future of the world. … got involved in work for voluntary or charitable organisations? … not counting anything you do for your family, in your work, or within voluntary organisations, actively provide help for other people? … help with or attend activities in your local area? If I help someone, I expect some help in return. My life involves a lot of physical activity. Do you ever feel frustrated by having watched too much television? How likely would you say it is that you will become unemployed in the next 12 months? How important is it to you to compare your income with other people’s incomes? Whose income would you be most likely to compare your own with? Please choose one of the following groups: work colleagues, family members, friends, others. Brown, S. L. (2003). An altruistic reanalysis of the social support hypothesis: The health benefits of giving. In New directions for philanthropic fundraising. Chapter 4, No. 42 (pp. 49–57). Wiley Periodicals Inc. http://www3.interscience.wiley.com/journal/107629291/abstract. Donovan, N., & Halpern, D. (2002). Life satisfaction: The state of knowledge and the implications for government (Prime Minister’s Strategy Unit). (http://www.strategy.gov.uk/2001/futures/attachments/ls/paper.pdf). Vittersø, J., Öhlman, H. I., & Wang, A. L. (in press). 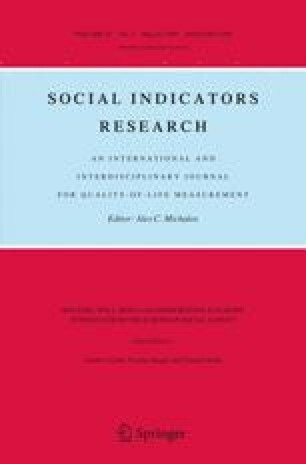 Life satisfaction is not a balanced estimator of the good life: Evidence from reaction time measures and self-reported emotions. Journal of Happiness Studies. doi 10.1007/s10902-007-9058-1.